There are more than 50,000 lawyers and only four Delaware Federal District Court Judgeships; but President Trump is bending over backwards to ignore every other person or firm, in a possible effort to aid and abet Mitt Romney and Goldman Sachs racketeering efforts, with Trump’s nomination of related parties Colm Connolly and Maryellen Noreika two people connected to MNAT law firm. Our nations top executive in charge of the corporation the United States of America President Donald J. Trump, has an observable, swampy love affair, with Goldman Sachs and Mitt Romney. Donald Trump has already stacked the deck high for Wall Street with the Goldman Sachs/ Bain Capital crony nomination of Sullivan & Cromwell’s partner, Jay Clayton, to be head of the SEC. On top of that in a move right out of the TV show House Of Cards, Trump put someone who once criticized the CFPB (Mulvaney) in charge of the Consumer Fraud Protection Bureau (“CFPB”); despite the common knowledge Mulvaney wants to end the CFPB. Though mainstream media is partially dependent on Goldman Sachs or Romney’s Bain Capital advertising revenue dollars, fortunately, for the sake of truth and justice, this reporter doesn’t depend on the revenue of greedy slobs and lobbyists. Mainstream appears to be afraid to tell the gruesome tales that I have been telling in this series. So, that leaves real reporting to our investigative series (here – here – here). First started with a simple question proposed, Does Wall Street Bully or Bribe Prosecutors? Revolving Doors At The DOJ? 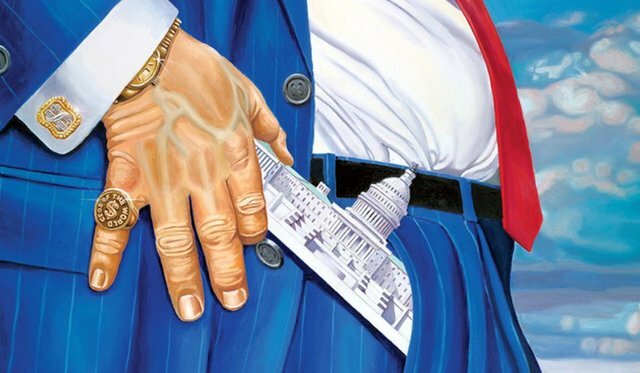 Wall Street lawyers and firms are directly connected to – federal agents, Goldman Sachs, Bain Capital, Paul Traub, Mitt Romney’s interest and Colm Connolly. These parties affirmed, are all responsible or culpable for organized crimes that ripped off thousands for billions, with people being threatened and even winding up dead! Yet no one has investigated the eToys' case or the people involved that lead to other cases of financial malfeasance. Even though the crimes are readily and visibly apparent, Goldman Sachs & Bain Capital’s unjust enrichments have eluded justice for decades plus, with more than 100 felony violations, of – racketeering, and colluding due to corrupt crony capitalism. Morris Nichols Arsht and Tunnell (“MNAT”) is a Delaware law firm in existence for a whopping 80 years. MNAT is neck deep in betrayal of court-approved clients for the sake of ill-gotten gains winding up in Sachs & Mitt’s pockets. In other words, they are deep within what Trump once referred to as the “swamp.” Everything Trump campaigned and said he stood against. It is inexplicable & intolerable that justice is turned on its head, in Delaware; where the SEC, FBI, other agencies of Justice and the courts are betraying their oath of office – openly ruling/ acting contrary to the law – even when law firms like MNAT confess some of their crimes. Ellen Slights was Colm Connolly’s Assistant United States Attorney that handled the eToys case; and she kept denying eToys fiduciary, and whistleblower Laser Haas, requests, to have the MNAT law firm related parties, investigated and prosecuted against for various crimes that Laser has documented throughout this series with this reporter. Neither Ellen Slights, nor any other Delaware Justice Department personnel, has done an honest job of informing Laser Haas or the eToys court and parties of interest that Colm Connolly was a partner of MNAT, in 1999, until August 2, 2001 (which is when Colm returned to the DOJ as top federal prosecutor in Delaware). Instead, Ellen Slights used Delaware FBI to threaten Haas! Attempting to address part of the problem of Delaware corruption, we have Senators John Cornyn & Elizabeth Warren reaching across the partisan divide, to stop “forum shopping” of federal bankruptcy cases. Unfortunately, as my recent article points out, the Senators are trying to put a band-aid on a massive bleed (see my article addressing the rackets of many organized crimes in these cases, including “Bankruptcy Rings” – here). Apparently, the Senators are unaware how serious the crisis is; and the fact that the venue shopping of cases is only the tip of the proverbial iceberg. MNAT was part of The Learning Company merger debacle that ripped off Mattel for $4 Billion, in 1999 (see details – here). It blew this reporters mind that people like David Sirota and Matt Taibbi passed on doing a story about the infamous Learning Company suit. Despite Rolling Stone, September 2012 cover story – “Greed and Debt: A True Story About Mitt Romney & Bain Capital” – being one of the biggest of all time for Matt Taibbi, that reporter claims one of his sources for the story ( eToys whistleblower Laser Haas) is harassing him. Taibbi went So far as to accuse Laser Haas of being a ghostwriter; and that this reporter wasn’t a real person (so I had a mutual acquaint clarify). While also emailing Taibbi to offer a chance to respond and work with this reporter to bring this corruption to the surface. It is true that I’m working hand in hand with Laser Haas, and I’m openly disclosing he is my source, but I have verified everything the whistleblower has provided me. This is one of the biggest stories regarding Wall St this reporter has ever seen it involves all the key players and as this series continues we will keep naming the bad guys. We have no idea why Rolling Stone/ Matt Taibbi or (International Business Times) IBT’s former guy, David Sirota took a pass on these hard-hitting stories; but this reporter, knows for a fact, there are MNAT lawyers who belong in jail (including Greg Werkheiser and former MNAT partner Colm Connolly). Taibbi’s Rolling Stone article was titled “A True Story About Mitt Romney”; and Taibbi did tell the truth, but Matt did not tell all the truths he was provided hence why I am here to tell what he left out. Stage Stores got its funding from Michael Milken junk bond money, that Matt Taibbi touched on slightly in his story that was originally reported by Boston Globe’s story that the large sum of money benefited the judge’s wife. Rolling Stone’s “True Story” is – far – from the “Whole” novel that I have collaborated with whistleblower Laser Haas to tell, to the world. To expose and depict how these crony practices work. to enrich themselves with impunity. Laser Haas is what this reporter has determined to be, a -serial – whistleblower. There are dozens in jail, several national fraud & Ponzi schemes halted, and a President wannabe disappointed; and Laser was there, 1st, with the info, many times. Including the fact that Mitt Romney was lying about when he quit Bain Capital, entirely. Back in 2001, Laser was the court-appointed fiduciary over eToys.com federal bankruptcy case; and MNAT was counsel. MNAT, in order to become the Delaware Bankruptcy Court approved attorney, for eToys, and also approved counsel for Laser Haas payments on running eToys; illegally concealed MNAT’s direct connections to GE, Bain Capital, Mattel/ Learning and Goldman Sachs. Bluntly, MNAT lawyers lied under oath, dozens of times with impunity. Meanwhile, Paul Traub, who was the “control” (receiver) partner of Tom Petters Ponzi, also worked for Romney’s bankrupt entity – Stage Stores. Traub’s firm was hired by Barry Gold, who worked under Stage Stores Directors, Jack Bush, of Dallas and Michael Glazer (btw, Glazer is now CEO of Stage Stores). Michael Glazer was a Director at Stage Stores while being simultaneous the CEO of Kay Bee; but Taibbi failed to note that in his “Greed and Debt” story because Matt was being snippy with his source, Laser Haas. It was Laser Haas who blew the whistle on eToys, Fingerhut, Learning/ Mattel, Tom Petters Ponzi, Marc Dreier and the very Kay Bee case fraud that was also a big feature in Rolling Stone’s “Greed and Debt” September 2012 cover story. As reported by Taibbi, Michael Glazer was CEO of Kay Bee, who paid himself $18 million and Bain Capital $83 million, prior to Michael Glazer filing bankruptcy of Kay Bee, in 2004. None of us mere mortals could ever dare to gift ourselves a few thousand dollars, prior to bankruptcy, much less millions, without suffering a federal indictment, prosecution and an investigation for fraud. This, of course, is because, none of us mere mortals have Sachs & Mitt’s ability to get their lawyer (Colm Connolly) to “revolve door” back and forth into the Department of Justice – as needs be – to aid & abet the many Obstructions of Justice! It was Laser Haas who blew the whistle on the fraud in the Kay Bee federal case. Including other facts, Rolling Stone should have reported, of Michael Glazer being in both Kay Bee and Stage cases. But, the more important thing is that fact that the Delaware Department of Justice actually came to the rescue of MNAT and Paul Traub, in the Kay Bee cases. Specifically, MNAT is the law firm openly representing Bain Capital of the $83 million; and Paul Traub was the one who asked the court for permission to prosecute Glazer & Bain. This is like Frank Nitti being the prosecutor of Al Capone! Auspiciously it was right after Laser turned down and reported Paul Traub, Barry Gold and MNAT’s million dollar bribe offer, that Colm Connolly (quietly) quit working as a partner of MNAT, in order for Connolly to become the top federal prosecutor, as United States Attorney, in Delaware. Prior to that, Goldman Sachs and Bain Capital were going to get their asses handed to them by Laser Haas stopping MNAT & Paul Traub from selling assets of the billion dollar eToys.com company to Bain Capital/ Kay Bee (with Glazer as CEO) – for a mere $5.4 million. Haas helped drive the bids up into the tens of millions. Ironically also in 1999, Goldman Sachs had ripped off eToys initial public offering (IPO) for hundreds of millions of dollars. Laser, as the head of eToys, authorized the suing of Goldman Sachs for their scheme. Paul Traub then nominated Barry Gold to be the guy Laser would hire to handle Goldman Sachs litigation in New York Supreme Court. ; but Traub failed to disclose the facts that Paul was partners and working under Barry at Stage Stores. After MNAT and Paul Traub were able to deceive Laser, the Creditors, the court and other parties of interest, Barry Gold locked Laser out of eToys on January 1st, 2002. 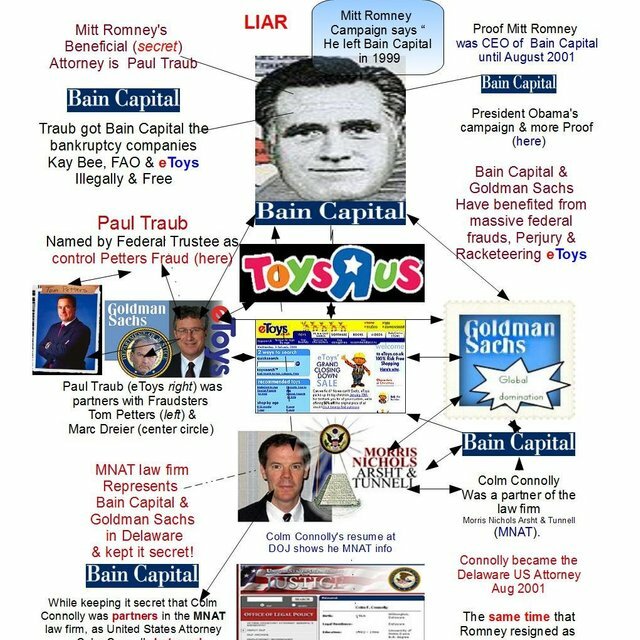 With their schemes appearing to be an apparent success, MNAT, Traub and Barry broke the law, by reducing the sales prices of eToys assets to Bain Capital (owned by Romney) and Kay Bee (owned by Mitt with Glazer as CEO). Not only did Paul Traub, Barry Gold and MNAT lawyers (including Greg Werkheiser, Colm Connolly and Ellen Noreika) have a duty to disclose; but there was also a duty to disclose by Michael Glazer and Mitt Romney. Which all the affirmed parties failed to make transparent. Laser sued all those parties, for Racketeering, in Los Angeles, after the eToys case judge ordered the clerk to block Laser from providing any more information to the court. As is typical, the California courts accepted the vastly bogus testimony of the Goldman Sachs, Mitt Romney, and Bain Capital attorneys, instead of whistleblower Laser Haas. 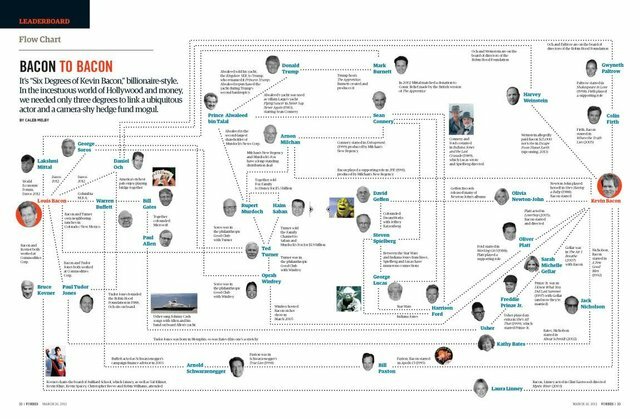 In 2005, Laser’s Smoking Gun evidences compelled MNAT to confess Goldman Sachs connections; and Paul Traub confessed Barry Gold was Traub’s partner after Paul’s law firm paid Barry Gold 4 separate payments of $30,000.00 each – prior to the “planting” of Barry Gold – into eToys. Intolerably, those confessions of lying under oath (and Traub even confessed intentionally lying – paragraph 18 – here) went into a void; because Colm Connolly was the Delaware United States Attorney, presiding over eToys and Kay Bee cases, from August 2001, until late in 2008. Laser did not get proof until 2007, of the facts that Colm Connolly was a partner of MNAT, in 1999 until August 2001 (see Colm Connolly’s resume at the Department of Justice website – here). Armed with that Smoking Gun proof of Colm Connolly’s resume, Laser filed an 18 U.S.C. § 3057(a) Complaint, with the Public Corruption Task Force, clear across the country, in Los Angeles. Demonstrating there already is a YUUUGE problem of undue power influencing cronyism and corruption, concerning Goldman Sachs cases, is the fact that the Public Corruption Task Force was – Shut Down – and career federal prosecutors were threatened to keep their mouths shut, about the reasons why (see March 2008, L.A. Times article “Shake-up tools federal prosecutors”). Additionally, in 2008, Then President George W. Bush, nominated Colm Connolly to become a Delaware Federal District Court judge; but Laser got some help from then-Senator Joe Biden, who blocked Colm Connolly’s judgeship vote from going forward. Former Vice President Biden can’t block Colm Connolly, this time around. Speciously, Trump is nominating parties and they are ignoring the blocking of candidates by Senators. Furthermore, Colm being an MNAT partner, in 1999, until August 2001, is a real alarming coincidence that Mitt Romney’s 2012 Campaign claims Mitt was – “retroactively” retired – from Bain, as of August 2001, back to February 1999. Would we ever allow Al Capone to “retroactively” retire from his organized crimes that have earned him hundreds of millions in ill-gotten gains? In the Petters Ponzi case, they went after Nuns elevator for the handicap; but Romney’s 3 car elevator garage is Scot Free! These cover-ups and other obstructions of justice are still plaguing our courts as MNAT nominated their partner in crime – Paul Roy Traub – to be the one to sue Goldman Sachs in New York Supreme Court, on behalf of eToys. In other words, Sachs sued Sachs and eToys lost – again. Paul Traub also was partners with fraudster Marc Dreier; and Traub settled eToys v. Goldman Sachs, for $7.5 million in Marc Dreier’s name, long after Dreier was in jail. That is to say, Jay Clayton’s law firm of Sullivan & Cromwell. Since Laser found the Smoking Guns that compelled Paul Traub and MNAT to confess (some) of their conflicts of interest, both MNAT and Traub’s gangs have retaliated against Laser and those that supported the quest for justice. Beyond the fact that Traub’s partners in crime (MNAT and Barry Gold) publicly argued about how much money Paul Traub gets (when it is against the law to give Traub a penny), the other factor is the law firm that represented Goldman Sachs. One of those people was eToys shareholder Robert Alber. We can’t ask Robert Alber to testify, anymore; because he was told – “people like you, who turn down a bribe, usually wake up dead”. Then Robert Alber woke up dead! Prior to Alber’s demise, Robert had to shoot/ kill, career criminal Michael Sesseyoff, in Kingman Arizona. The party who threatened Alber was Johann Hamerski, who claimed to be an associate of Jack Abramoff. Ironically the Assassination attempt on Alber happened after Jack’s release. Abramoff also tried to gain undue power and influence over federal cases, in Delaware (see page 12 of Congressional records, of Jack Abramoff’s email concerning handpick of Region 3 United States Trustee – here). It is not just the above-named parties who are complicit or duplicitous in the organized crimes, corruption, and cover-ups. Back in 2005, when Laser was having some success in finding Smoking Gun proof of the crimes, the Department of Justice Deputy, Lawrence Friedman, emailed Laser a direct, personal, promise that Lawrence Friedman was on top of the case. Then Laser discovered that Friedman appeared to be keeping his promise, in making a United States Trustee Motion to Disgorge Paul Traub’s law firm, for $1.6 million; but Laser also learned Paul Traub and MNAT were doing more crimes, including the Kay Bee case $100 million dollar fraud. Instead of stepping up to the plate and making good on his promise, Lawrence Friedman took the easy way out, by resigning. One of the steps Friedman took, to placate Haas and eToys shareholder, Robert Alber, was the removal of Region 3 United States Trustee, Roberta DeAngelis; and replacing DeAngelis with Kelly Beaudin Stapleton, on December 22, 2004. Coincidentally (as if we don’t have too many coincidences – already), December 22, 2004 was the day of the eToys Emergency Hearing to address Paul Traub/ Barry Gold issues. Making matters worse, Clifford White III took over for Lawrence Friedman, and Clifford snuck Roberta DeAngelis into the key role of being General Counsel of the Executive Office of United States Trustees (“EOUST”)..
Clifford also kept Mark Kenney in place, as a DOJ trial attorney involved in MNAT and Paul Traub cases. It was Mark Kenney who defended Paul Traub by promising that the EOUST would stop doing its job. Meanwhile, Clifford also was manipulating things in NY, Minnesota, and Florida, to protect Paul Traub from prosecution. Demonstrating the further crisis of handpicking of persons who are already aiding Goldman Sachs & Bain Capital, all across the country, is the fact that Paul Traub remains – above the law – no matter how many crimes and corruption occur. It was factually, publicly noted by the Federal Receiver in Tom Petters Ponzi, that Paul Traub “controlled” Petters (see first few pages of Receiver suing Paul Traub – here). It is Clifford White’s breach of fiduciary duty and betrayal of the public’s trust, as the reason why Traub is not prosecuted for bankruptcy frauds in NY, DE, TX, and Minnesota. Granted, Clifford gets help. In Minnesota, Marty Lackner was part of a billion-dollar feeder fund to the Tom Petters/Paul Traub Ponzi. Like Delaware’s Colm Connolly connection “revolving doors” with the Department of Justice, Marty had a real “in” with the DOJ. Marty Lackner was the brother of James Lackner. That’s Assistant United States Attorney, Head of Criminal Division, James Lackner. Regrettably, like Robert Alber, we can’t ask Marty any questions either; because Marty Lackner was also found dead. James Lackner, Mark Kenney, and Ellen Slights are still at their posts, regularly obstructing justice, to protect MNAT, Goldman Sachs, Paul Traub and Mitt Romney’s Bain Capital, from investigation and prosecution. Now those parties also have Sachs and Bain connected Jay Clayton as SEC Commissioner, who is already guilty of obstructing justice. Laser sued Trump, the DOJ, FBI, and SEC to block Jay Clayton. In a legitimate era of justice, Jay Clayton would have informed the Public Integrity Section, as should have Ellen Slights, who Laser also named in his March 2017 lawsuit, in D.C. Problem is, the corruption of our federal system of justice is so systemically and incestuously entrenched that the D.C. Clerk of Court buried Laser’s lawsuit until 3 weeks after Jay Clayton was confirmed. Be that as it may, all those parties received their copies of the lawsuit; and we are now 3 weeks away from it being a full year with nothing being done about organized crimes running amok! Now Trump seeks to gift Goldman Sachs and Mitt Romney more racketeering protection by the President nominating a very corrupt federal prosecutor (Colm Connolly) and a partner (Maryellen Noreika) of the MNAT law firm doing organized crimes, so that MNAT can have more associates on the courts. By more I mean Colm Connolly clerked for MNAT partner Walter K. Stapleton, before Colm Connolly was arranged to be a Delaware federal prosecutor. Beyond that, we have a question Laser raised about whether or not 3rd Circuit Judge Walter K. Stapleton was related, in any way, to Region 3 United States Trustee, Kelly B. Stapleton. Albeit we may have our answer, because as soon as Laser asked the question, Kelly B resigned! We don’t have any proof that Maryellen Noreika is directly connected to eToys organized crimes, but we do know Noreika has been a partner of MNAT for 23 years. Beyond the fact that MNAT is not a nationwide law firm, the fact of the matter is that Noreika had to supply answers to a Senate Judiciary questionnaire; which includes a query on – conflicts of interests – issues. Laser emailed Maryellen Noreika and Colm Connolly, concerning the facts, and Haas warned Noreika that these crimes being properly addressed means the end of the MNAT law firm. It is nationally significant and important that Colm Connolly is guilty of protecting Goldman Sachs, Bain Capital, MNAT, Michael Glazer, Paul Traub and Mitt Romney from federal investigations or prosecutions. Here is a copy of Colm Connolly’s Judiciary questionnaire; and a copy of Maryellen Noreika’s questionnaire. Though they both disclose the fact they are associated with MNAT, neither of them have disclosed the ongoing organized racketeering crimes of MNAT that Laser has submitted them evidence of. Both Noreika and Connolly are duty bound, and commanded by law, to report these issues; and their failures to do so most certainly disqualifies them for the federal bench. Hopefully, the spreading of this news story will cause them both to withdraw. Surely, out of 50,000 lawyers in Delaware, there are other persons far better qualified to fill the vacant Delaware Federal District Court judgeships! By the way, one final coincidence: one of the vacant seats was that of Judge Kent A Jordan, who threatened MNAT and Paul Traub during an October 16, 2006, Emergency Hearing. Three weeks later, Judge Jordan was promoted to the 3rd Circuit court. Judge Sullivan was the one who ended the eToys case after Judge Jordan was promoted off, and Judge Sullivan is a party supporting these nominations. Delaware is under question for bankruptcy court fraud aided by corruption; and both Colm Connolly and MNAT are proof of point that bankruptcy court fraud is aided by corruption. Colm Connolly and MNAT are guilty of aiding and abetting racketeering. Colm Connolly’s office noticeably blocked investigations and prosecutions of MNAT and MNAT’s clients Goldman Sachs, Bain Capital and their Frank Nitti guy – Paul Traub. The evidence is overwhelmingly “clear and convincing” that Colm Connolly is unfit for the federal bench; as well as Maryellen Noreika because she is also connected to MNAT, and remains silent on these issues. 50,000 lawyers in Delaware means Trump has plenty of people to choose from, and justice demands he picks other candidates not connected to MNAT. How many more coincidences do you need to see the level of corruption surrounding just this case alone? Again we ask, Does Wall Street Bully or Bribe Prosecutors? Very inspirational. We are not a product of our circumstances. Rather, we are products of our decisions. court now if a lot of money is over, now all the officials are a lot of corruption, a useful post friends. Congratulations @an0nkn0wledge, this post is the tenth most rewarded post (based on pending payouts) in the last 12 hours written by a Superuser account holder (accounts that hold between 1 and 10 Mega Vests). The total number of posts by Superuser account holders during this period was 1426 and the total pending payments to posts in this category was $10363.52. To see the full list of highest paid posts across all accounts categories, click here.